Readers of The Unmutual Website may recall that the attendees of the October 2004 Prisoner Locations Walkabout were accompanied on their tour by several Prisoner Edition Caterham Seven cars, complete with writers and photographers, for a feature in a highly-respected motoring magazine. 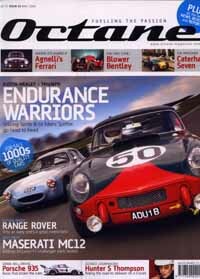 We are delighted to announce that the May issue of Octane Magazine, which went on sale on April 2nd, includes a 6-page article, littered with colour photographs of the Sevens outside various Prisoner locations featured along the walkabout, which covers the history of the Seven, and the part it played in The Prisoner. As well as attending the walkabout, and keeping in contact with this website and others for background information, including US Prisoner Seven owner Steve Landes, feature writer Richard Fleury also interviewed Caterham director Graham Nearn at length for the article about his dealings with Patrick McGoohan, as well as his work for the company. With thanks to Richard Fleury and Steve Landes for the images, and for the Unmutual URL in the article.